In a landmark achievement, 21 Asian nations including China and India on Thursday signed on a new infrastructure investment bank which would rival the World Bank. 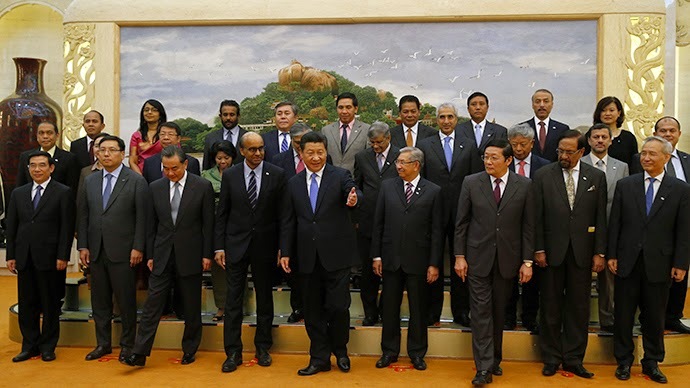 The governments of Bangladesh, Brunei Darussalam, Cambodia, China, India, Kazakhstan, Kuwait, Lao PDR, Malaysia, Mongolia, Myanmar, Nepal, Oman, Pakistan, Philippines, Uzbekistan, Qatar, Singapore, Sri Lanka, Thailand, Uzbekistan, Vietnam signed on as founding members of the new Asia Infrastructure Investment Bank (AIIB) in Beijing on Friday. Chinese Finance Minister Lou Jiwei said on Friday the “multi-national financial institution which is fair, just, open … with a good governance structure” will be an “efficient financing platform for infrastructure”. Lou said the AIIB has a different focus than established multilateral organizations such as World Bank and Asian Development Bank (ADB). China and other emerging economies, including BRICS, have long protested against their limited voice at other multilateral development banks, including the World Bank, International Monetary Fund and Asian Development Bank. Chinese President Xi Jinping had last October proposed to establish the AIIB to boost Asian economic integration and infrastructure projects like roads, railways, ports across the region. The new Bank has a capital target of more than $100 billion. US allies Japan and Australia alongwith South Korea and Indonesia are notable absentees from the list of nations who signed up for the China-led Bank. The AIIB will extend China’s financial reach and compete not only with the World Bank, but also with the Asian Development Bank, which is heavily dominated by Japan. In July, World Bank Group President Jim Yong Kim said that he welcomed a new multilateral infrastructure bank, saying there was a “massive need” for new investment in this area. The BRICS nations have already announced a $100 billion development bank during the 6th BRICS Summit in Brazil this year. For our SEAWAPA project, our corporate members in Laos will be working closely with the Lao government and AIIB proposals and will analyze the offers against World Bank and ADB counterpart.